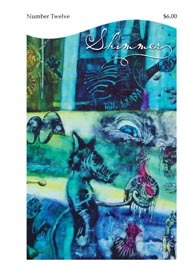 If you’ve read Shimmer before, you know what to expect: a delicious collection of imaginative short stories. If you’re a new reader, welcome! Let me tell you a little more about Shimmer. Wow! Not bad for 100 pages of fiction. Our stories are mostly contemporary fantasy, with a few ventures into science fiction or horror, and the stories tend to be tinged with sorrow (though we’re not averse to the occasional funny tale). We publish a wide range of authors, from those you already know and love, like Jay Lake and Ken Scholes, to the rising stars like M. K. Hobson, Aliette de Bodard, and Angela Slatter, to the new authors you don’t know you love yet, like Krista Hoeppner Leahy and Erin Cashier. We released our first issue in 2005. We’ve gotten stronger with each issue, and Issue 12 contains wonders and marvels, from Peter M. Ball‘s punk-not-emo teenage werewolf story, to Josh Storey‘s gorgeous take on the tale of Orpheus, to Monica Byrne‘s story of stigmata in a colony on a distant planet. We’ve got an imaginative reinterpretations of Little Red Riding Hood and the Wizard of Oz, and a sweet little zombie love story. And more! We packed 9 stories into this issue. At just over 100 pages, the print edition is slim and sturdy enough to carry with you to read anywhere. Shimmer’s one of the best-looking magazines out there: glossy covers, lovely illustrations, and perfect-bound (just like a paperback book). Or get the PDF edition if you prefer to read in DRM-free digital form. Click the buttons below to buy either the sleek print version, or the DRM-free electronic edition. Or click here to get a 4-issue subscription. So the trouble starts like this: Mike likes Carly and Carly doesn’t like him back. Mike’s trying to figure it out as best he can, then he turns fifteen and this werewolf thing happens — boom — and he spends three nights a month camping out in the middle of nowhere because a pining teenage werewolf and the full moon just aren’t a great combination. It’s enough to make you feel bad for the guy. None of this is news, yeah? I mean, the werewolf thing maybe, but the rest of it’s obvious. You see the two of them together all the time, Carly with her wireframe glasses and her hot-pink bob, Mike with his eyeliner and his older brother’s black Nirvana shirt, and it’s clear to everyone Mike never considered wearing mascara before Carly decided she was into punk — punk, not emo — and Mike decided to become punk-not-emo too, just like that, trailing along after Carly like her own private entourage of one. Your class is held at an ungodly hour by undergrad standards, but news of your madness draws them to you anyway. Rumors that you’d give out easy A’s, coupled with a voyeuristic urge to peer into grief, ensures your lecture hall is filled. You are not easy on them. Oh oh oh, let me tell you about Nygibe — fair and wise, with skin as dark as the night and eyes like rising embers. She was just a girl, see. She didn’t know of inland or outland, winter or spring. Where she lived was the coast, and there it was always hot. Agawa poured light down all the time, and for them, it was always summer. When she was small, she learned to weave nets with her mother, until her mother passed away. Then Older Brother took her up. What did he know of raising a girl? Nothing. So he took her out on boats, learned her how to swim, and set her to fixing nets and carving fishing spears. On every spear, she carved the story of his success, and every spear he threw out came back with a fish on the end, just like she’d written it. They were very happy, for a time. My cape was a long red thing. My mother spent day after day spinning yarn from nettles, night after night weeping over a loom. She bit her own tongue and spit the blood to dye the yarn. By the end of the weaving she couldn’t speak. She did all that, even after I told her nettles wouldn’t make good yarn, nights aren’t good for spinning, blood would fade after so many washings. “My mother makes me wear it in case I die in the woods,” I said, “so she can find my corpse with ease.” Being on the cusp of womanhood, I am always on the brink of disaster and death. He had bungled the last job, taken too long on this one, and the Organization was sending an assistant. A younger man (they were all younger these days) who would steal the case, steal the promotion. Perhaps if he worked faster, he could uncover a lead before the assistant arrived. Maybe significant progress toward finding the creature would be enough to get him safely behind a desk before it was too late. He gazed out at the rundown buildings across the road, the boarded windows and padlocked doors. He heaved himself from the chair and went out into the heat, rubbing at the pale band of skin on the ring finger of his left hand. For hours, he trudged through stores and along sidewalks seeking signs of the creature. In a crowded laundromat, no one looked at anyone — each was engrossed in the inner world that city people often built for themselves. He had just made a rough circuit of the place, one of a long series of rough circuits around the neighborhood, all equally fruitless. He was halfway to the door when he saw it. When he saw her. Roger brings me into the backyard and there’s the Francophile snowman, greeting me with a tip of his beret. He’s the snowman of the story books: a column of three perfect spheres, thin arms made of sticks, a button nose, two marble eyes, and lips of roasted peppers. And of course a checkered beret, a purple ascot, and a cigarette. Few folks know that zombies prefer cat brains over human ones, cats being a smidge smarter and all. Problem is cats are just so damned quick. Then again, few folks know anything these days on account of there just being two of us left. And I can’t rightly call myself human anymore, now can I? Dr. Arbuckle performs last- minute tests on the machine as I watch. She swats me away when I get too close. Not in a mean sort of way, but like Renée used to when I’d lift the lid off the stew pot to sneak a taste. Way back then, before Renée got the side of her head all chewed up. Back then, when I still ate stew. Phil dreamt of the sea the way candles dream of flame. He would have fled to the sea long ago — candle wax vanished into air — but unlike candles, Phil had Molly. Molly who’d rescued him, held him close, her song of a face whispering its own drenching temptation. But still, some nights after Molly fell asleep, the sea sang, and Phil couldn’t resist. Rusty step after rusty step, he would creak his way down to the shore. In the salt-scented air, the pull and call of the wide water begged him to wade, dip, dive in if he dared. It pleaded with him to abandon his rusted ankles, elbows, hips, knees, iron joints, and strong shoulders to the blue wet of possibility. It promised him he would not only float, but would sail free. Come, come home to me. We descended to the moon, lurch after lurch, like a marble dropping down a staircase. … After we cleared the clouds, I strained to see the colony, which resembles a warren, built out of solid basalt. It houses all twelve residents. The compound rests just within the dark side of the moon. New Laverne does not turn as it orbits, but rather keeps the same face sunward. The border between dark and light is only a mile away. The colonists live in twilight. At the landing pad, I met Abbot Flores, the head of the colony. Hiro, I really thought I had prepared myself for the thing for which the colonists of New Laverne are famous, but upon coming to the moment, I realized I had not taken it to heart. Redness bloomed upon the abbot’s hands, head, and feet, the gleaming jewel-like red of open wounds, oozing rosy fluid. Upon seeing this, my own heart bloomed with adrenaline; I would call it an animal intimacy, a shared pulse. Ready to read the rest? Select your edition below–either the sleek print version or the economical electronic — and click the Add to Cart button.